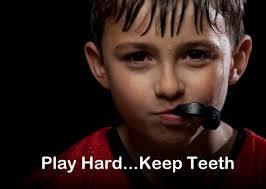 A mouthguard is a flexible rubber device that sits on the top arch of the mouth to protect the teeth from trauma. If you play a sport with the chance of contact, you should really consider wearing a mouth guard. Thousands of kids every year could prevent dental trauma by simply wearing one. When should you wear a mouth guard? There are obvious sports including boxing, rugby, AFL. There are also sports where contact is not expected but on occasion occurs such as basketball, netball, baseball, hockey, water polo, lacrosse and horse riding. It can be beneficial to wear mouthguards for some activates where contact is not even involved, such as working out; because people tend to grind their teeth when they exercise. A custom-fitted mouthguard helps to protect several parts of the head and mouth. 1. It will protect the teeth upon impact to avoid damaged, knocked out or broken teeth. 2. It will cushion the jaw to prevent breaking or dislocation of the joint. 3. It can protect the lips, cheeks and tongue from damage. 4. It can aid in the prevention of neck injuries. 5. Some studies even claim that it may reduce the chances of concussion. Where can you get a custom-fitted mouthguard? You can get a custom-fitted mouth guard from the dentist. The dentist will take an impression of your upper teeth to make a mouthguard that is specifically fitted for you. They will be better because they are more comfortable than over the counter mouthguards. There is significantly lower chance that the mouthguard will be dislodged during the activity. Mouthguards that do not fit properly provide poor levels of protection, with some studies stating their level of protection is next to none. You should have your mouthguard reviewed at the dentist every 6-12 months to make sure it that it is still doing an adequate job. How should you clean the mouth guard? Mouthguards have to be rinsed out under cold water after each use. They should be dried first (eg with a clean paper towel) to prevent bacteria growing on them and stored in a plastic container. You should store them in a cool place as mouthguards can change shape under high temperatures. Mouthguards are an excellent protective device and the price of a mouthguard will be small in comparison to the cost of repairing damages to the mouth.